Ben Greiner, President of Forget Computers and Robot Cloud, believes anyone who manages a help desk should be motivated to improve the efficiently of that help desk. 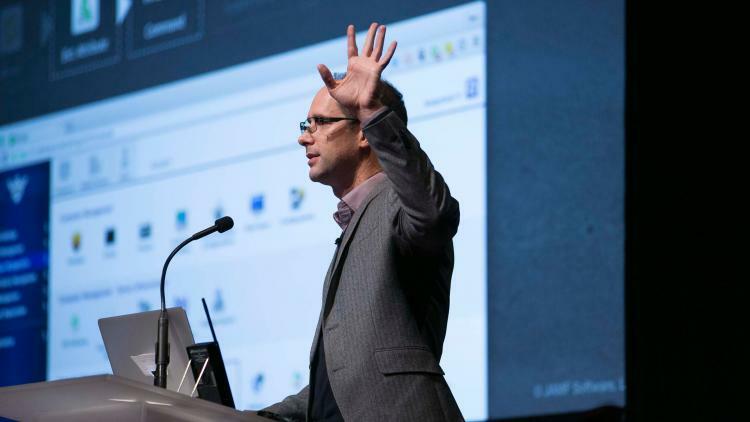 That's why he took to the stage at the 2015 JAMF Nation User Conference (JNUC) to discuss how Forget Computers uses features within the Casper Suite to deliver intelligent, automated alerts directly into their help desk, and how this augmented approach benefits IT and end users alike. As Greiner explained, Forget Computers uses Zendesk, but the concepts he discussed can be applied to any established ticketing system with an Application Program Interface (API). He discovered they had a scaling problem. Tickets were being created but manually assigned. On Mondays, there were many more tickets than the rest of the week, and finally, a manual process meant that errors were more likely to occur. Tip 1: Beware – automation can get out of control. With an aim to transform their organization and solve these scaling issues, they moved to a new way of thinking – from “manual” to “modern” using automation. The manual workflow consists of 1) Discover the problem 2) Create a ticket 3) Investigate and resolve. Explaining his point, it appeared that issues were being auto remediated and tickets created to notify the user. Easy right? Well, that’s a lot of tickets, and a lot of emails. Tip 2: Verify a challenge with automation, knowing the automation is working! Know your customer. Why not allow our end users to not only interactive through support desk, but create new tickets in the Finder. Overcoming the issue of adding emails to inboxes, rising above the clutter of email. One of the last big problems for Robot Cloud was timing. Launchd enables them to time notifications based on the extension attribute. Giving them the flexibility to trigger notifications when needed. Tip 3: Know your environment: Older versions of OS X become increasingly difficult to support. It may take some time and scripting but it’ll be worth the effort. They had 2,400% more tickets than the rest of the industry, and reduced it from 50-60 tickets per day to 10-20. The moral of this story, is be there for your customers. Automation is great, but if you use too much, it can get out of control, creating email after email. Thinking out side of the box to create new ways to interact with users has vastly streamlined their support tickets, enabling them to scale as a business.